Our rohe is located on the east coast of the North Island of New Zealand. The rohe runs from Koputūtea (the outflow of the Waipaoa River, which in the early nineteenth century flowed into the Awapuni Lagoon) by the moana to Pākirikiri, Papatewhai, Rangihaua, Te Matamata, Ōrongo, Taikawakawa, Whareongaonga and Tikiwhata, then to Paritū. From there it extends inland to Te Toka a Haerengarangi, Whakaumuatetekauae Taumutu, Paritū, Whareongaonga, Tarewauru, Te Toka a Tutekawa along Te Ārai Stream to Karaua thence to Koputūtea. These rohe markers encompass Tawera, Te Taumata o Te Whare o Rata, Kaitoke, Tawatapu, Mātītī, Tawhitinui, Pukehaua, Waikirikiri, Waiari, Waipuna, Waimakaweheru, Mihimarino and Te Kurī a Paoa. 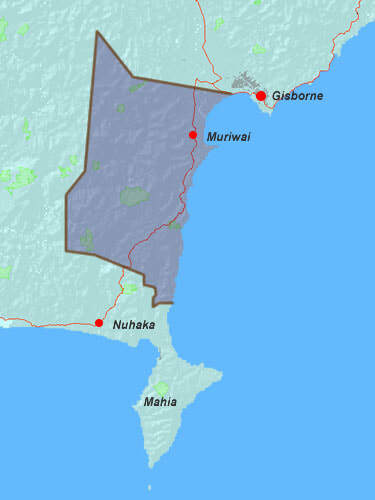 Today we describe our rohe as ‘Mai i Paritū ki Koputūtea’ from Paritū (south of Muriwai) to Koputūtea (in the north). I ōna wā, ko Koputūtea te huinga o ngā awa o Waipaoa me Te Ārai. Ko tōna ngutuawa i te raki o te wahapū o Te Wherowhero. Koia te tohu o te rohenga whakateraki o Ngāi Tāmanuhiri, ā, koia hoki te tohu whakatetonga o te rohenga o Rongowhakaata. At one time, Koputūtea was the confluence of the Waipaoa and Te Ārai rivers. 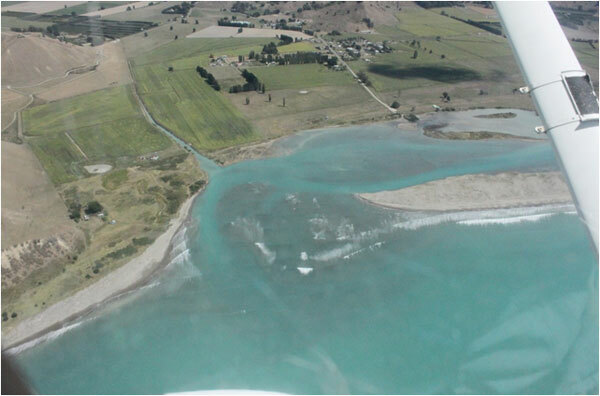 It flowed into the northern end of Te Wherowhero lagoon, marking the boundary of Ngāi Tāmanuhiri and the neighbouring tribe, Rongowhakaata. He wāhi motuhake a Te Wherowhero ki a Ngāi Tāmanuhiri, ki ngā iwi hoki o Te Tairāwhiti. Koia pū tētahi o ngā kāinga tuatahi o ngā tīpuna, koia hoki te okiokinga o te waka o Horouta. E whakaora ana i ēnei rangi, mā te whakatō i ngā tipu e tika ana mō Te Wherowhero. 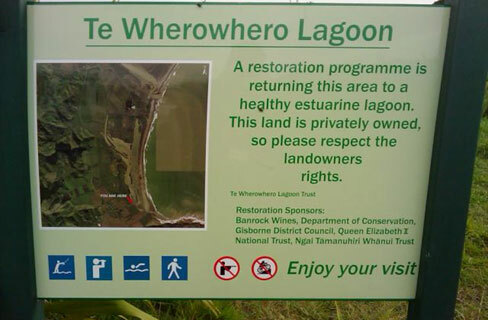 Te Wherowhero lagoon is of considerable cultural significance to Tāmanuhiri and the tribes of Te Tairāwhiti. It is one of the first settlements of the ancestors and the eventual resting place of the ocean-faring canoe, Horouta. Today, Te Wherowhero is undergoing restoration with the planting of native flora. E mōhio ana a Aotearoa whānui ki ngā paripari mā, ko‘Young Nick’s Head engari ko Te Kurī a Paoa te tino ingoa ki a Ngāi Tāmanuhiri. I whakaingoatia a Paoa mō tana kurī a Whākao. Ka raru a Paoa i te ngaronga o tana kurī. I ōna rā, whakatū ai ngā rangatira i ngā pā tūwatawata ki runga i tēnei kūrae. I pēneitia rātou te take, he māmā te wahi rā ki te tieki i ngā kāinga i te whakaekenga o ngā hoariri. Recognised by the rest of New Zealand as ‘Young Nick’s Head’ this iconic headland is known as Te Kurī a Paoa by Ngāi Tāmanuhiri. Te Kurī a Paoa personifies ‘Whākao’ the beloved dog of Paoa, the captain of Horouta waka. Whākao lost his way and caused his master much grief. Successive chiefs established fortified villages or pā along this iconic headland. It provided tribal leaders with a strategic lookout, enabling them to monitor lands, waterways and neighbouring tribal interests or infringements. I whakaingoatia mai a Te Muriwai Mai Tawhiti e ngā kaumoana o te waka o Horouta kia whakamahara ki Te Muriwai i mahue mai i Hawaiki. Mai i tērā wā, ki tēnei wā, kua noho a Ngāi Tāmanuhiri ki Te Muriwai. I heke mai ētahi whānau i Pīti Tāone ki Te Muriwai noho ai te take i kaingia e te moana o rātou whenua. I te tau 1912 ka hangaia te whare o ‘Waiari’. I te tau 1916 ka hūnuku Te Poho o Tāmanuhiri i Rō Pā. Ka whakatū hōro ki te taha o te marae hei whakamahara i ngā hōia o Te Pakanga Tuatahi. I kaha a Ngāi Tāmanuhiri ki te tautoko i ngā hōia o Te Pakanga Tuarua, ā, i whakatū wharekai i te tau 1946. E ora tonu ana te kāinga o Te Muriwai. Te Muriwai Mai Tāwhiti was named by the crew of the Horouta waka, in remembrance of the Muriwai that was left behind in their beloved homeland of Hawaiki. The settlement that was established generations ago, continues on in the village to this day. Families migrated into Te Muriwai from Pīti Tāone, as the ocean reclaimed the land. The whare ‘Waiari’, was built in 1912. This was followed by the World War I Memorial Hall at the heart of Te Muriwai Marae. In 1916, Te Poho o Tāmanuhiri was relocated from Rō Pā. Along with the memorial to World War II efforts, the dining room was erected in 1946. Today, the heart of Te Muriwai continues to beat. Ko Mātītī te taumata tirotiro o Tāmanuhiri. Kei ngā whenua o Maraetaha, kei te taha hoki o te awa o Maraetaha. Ko Mātītī te pā tūwatawata o Tāmanuhiri. Mai i Mātītī, mātai te titiro whakateraki ki Tūranganui a Kiwa, whakatewhenua ki te uru ki Whakapunake, ā, whakatetonga ki Te Whare o Rata ki Te Māhia hoki. Mātītī is one of the prime mountains or taumata tirotiro of Ngāi Tāmanuhiri. It stands on the lands and beside the river known as Maraetaha. It was once the primary home, or pā, of the eponymous ancestor, Tāmanuhiri. From this vantage point, Tāmanuhiri had a panoramic view to Tūranganui ā Kiwa in the north, inland to Whakapunake, south to Te Whare ō Rata and Te Māhia. 30 kiromita whakatetonga i Tūranganui a Kiwa a Tawatapu. I whakaingoatia mai i te nohotanga a tētahi rangatira ki te taha o te rākau tawa. Nō reira te ingoa Tawatapu. He kainga noho a Tawatapu i mua i te taenga mai o te Pākehā. Nō muri mai, ka whakanuia a Tom Bartlett he tangata patu wēra, he tangata pākihi, a, ka whakaingoa te wāhi nei ko Bartletts. Ka hangaia whare hou, ā, i te tau 2012, ka tūwhera te marae o Rangiwaho ki te take o te maunga o Oraki. Situated 30 kilometres south of Gisborne, Tawatapu takes its name from the rangatira who rested by the Tawa tree. Thus Tawatapu, the sacred tawa tree. In later years, a tribute was paid to Tom Bartlett, an early whaler and prominent businessman, by naming the area Bartletts. Rebuilt and opened in 2012, Rangiwaho Marae sits at the foot of Oraki Maunga. Ko Tāmaraukura te mātāmua o Tāmanuhiri. Ka noho nei hei rangatira mō Whareongaonga i te moetanga ki a Ruakumea, te tamāhine o Tawake-Whakatō. Ko Whareongaonga te ingoa o te whanga, te maunga me ngā whenua hoki mai i Te Kōpua ki Wharerata. Tāmaraukura, the oldest son of Tāmanuhiri, became the chief of the Whareongaonga after marrying Tawake-Whakatā’s daughter, Ruakumea. Whareongaonga is the name of the bay, maunga and lands of the area between Te Kōpua and Wharerata. E ai ki ngā kōrero i noho a Rata ki tōna pā ki ngā whenua o Paritū. Ko tōna tikanga, he tino ngahere kei ngā pae maunga o Tāmanuhiri. Ko Wharerata. Ancestors talk about Rata, who lived at his pā on the Paritū lands. The significance of Rata is that the great forest on the highlands of Tāmanuhiri became known as Wharerata. Ko Paritū te rohenga whakatetonga o Ngāi Tāmanuhiri. E tohu ana i te huinga o ngā rohenga i waenga i a Rakaipaaka me Rongomaiwahine. Ko Paritū te tipuna mana nui i ēnei whenua i mua i a Tāmanuhiri. Paritū is the southern boundary of Ngāi Tāmanuhiri. It is also the meeting of boundaries between Rakaipaaka and Rongomaiwahine. Paritū was an ancestor who had considerable mana over these lands and people before the time of Tāmanuhiri.